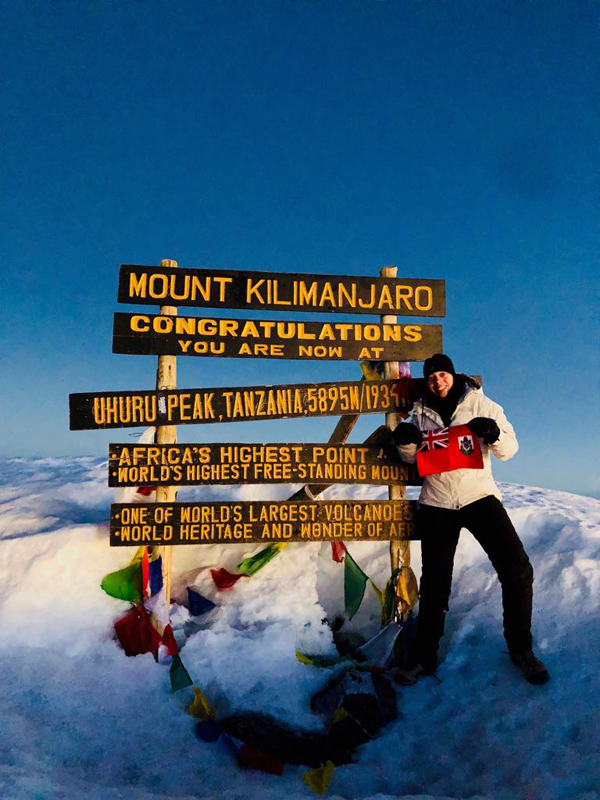 On June 8th, Courtney Diamond reached the summit of Mount Kilimanjaro in Africa, where the US-based mountain climber held the Bermuda flag at the top of the world’s highest free standing mountain. Ms Diamond tells us more…. 1. What inspired you to do the journey to Kilimanjaro? I am an adventurous person and I am always looking for a new and exciting challenge to tackle. When I was presented the opportunity to go to Tanzania for a graduate school trip, the idea to hike Kilimanjaro naturally came into consideration. 2. How long did it take you to put the plan into action? I did research and made the decision to book the climb in about a month. After that, it was 4 months of preparation and training between when I booked the climb and left for Africa. 5. Where did the climb start from? 6. How far up was your first stop? 7. If anyone was interested, how would they go about it? The most important step is researching the right tour company. This can be difficult because some people estimate the number of guide companies and independent guides in the thousands. We used a combination of word of mouth referrals and TripAdvisor reviews to decide on the right company for us. Once you have the tour company, they really take care of the rest. From that point, you just need to set up your travel arrangements, get the correct gear as advised by the tour company and physically train for the challenge. We used a company called TrekkingHero that leads trips on Kilimanjaro, Mt. Everest Base Camp and Patagonia and had a wonderful experience with the team. 8. Was it a difficult climb? There are several different routes up the mountain with different difficulty levels. We went on the Lemosho route which is a 7 day route. This is slower than the traditional 6 day routes that many people take up the mountain. The 7 day route provided a very scenic tour across the mountain through moderate terrain. There were ups and downs throughout the 6 – 8 hours of hiking per day, but overall the route was physically manageable and beautiful. The summit push which begins at midnight and ends at the peak around 6:00am was a very strenuous trek up the steep mountainside. It was dark and conditions were a chilly -11F. This was definitely the most difficult physical activity I’ve ever done. The challenge was well worth it once we made it to the summit at sunrise. It was a breathtaking sight that very few people get to see. I felt very fortunate and grateful as I stood on the top of Africa. Congratulation Courtney! Your Bermuda family is very proud of you!! Just seeing your accomplishment. How exciting. Very proud of you and to be related. CONGRATS!